It’s only been since June that I wrote about the major upgrades to the studio but there have been a few more enhancements that I’ve done to try to resolve issues I was still having. They really break into two issues. First, Chroma Keying and second, working space. Getting a “clean” Chroma key is really difficult. It’s not that big a deal when you’re just lighting a single subject but as the area you’re trying to key is getting larger and larger it becomes progressively more difficult to get the right results. There were two specific things I was dealing with. The first was that the green was spilling onto my subject. The reflected light from the backdrop was reflecting onto the person so they’d have a green hue about them. This problem was caused by a variety of factors including the distance between the background and the subject as well as the amount of front lighting that the subject had on them. Second, I was having trouble getting even lighting across the entire width of the scene. The four foot sections of bulbs just wasn’t cutting it. My first attempted solution involved adding some lights to compensate for shadows on the green screen created by the objects in the scene. So I’d hide small adjustable LED lights behind things like the monitor that was on-scene. 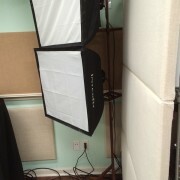 I love the Neewer CN-576 lights that I got but I could never quite get the lighting right. I’d take a test shot put it in the editing software and see what I got – and invariably I’d realize that I didn’t like how clean the Chroma key was. I decided that I needed to be able to see the Chroma key live. I wouldn’t normally do live keying but I needed a way to see things live and make small adjustments. That led me to the BlackMagic ATEM Television Studio Production Switcher. It’s a work of art and it allowed me to literally see the impact of my lighting to the Chroma key I could get. It had the side benefit of having a built in H.264 encoder so now I could quite literally live stream video from my studio. This allowed me to fine-tune the lighting but I still didn’t like the results of the Chroma keying. It could get a solid key but the problem was that it took a fair amount of effort to get things setup and my goal was a studio that I could just get going in and not have to worry about tweaking too much. I ended up adjusting my preview monitors on the tower to make room for a dedicated preview for the ATEM on the bottom. This meant moving the second preview monitor up above to right about the second camera. It means that the tower looks like a bunch of TVs but at a glance the on-camera talent can see everything that is going on. As a quick sidebar, the ATEM is a bit picky about the signals it’s getting in. My primary cameras were fine but I sometimes include some cheaper side-cameras for off-angles. Because the ATEM offers six channels (two are SDI only and two are SDI/HDMI and two are HDMI) I wanted to be able to include my off-angle cameras and be able to preview them. That meant finding a scan converter that would create a signal the ATEM liked. I found the Decimator MD-HX Cross Converter which does a wonderful job of cleaning up the signal and as a bonus converts it to SDI. Back to my problem of having trouble getting even lighting for the Chroma keying. The solution was to custom make some strip lights. I got some white surface-mount LED strips and a power supply and created my own light. The LEDs themselves are sold as SMD 5050s. SMD stands for surface mount device. The 5050 is the size of the LED. A strip is 5 meters long only $10.99 at the time of this writing. I ordered three spools of the LED lights, two dimmers, and two power supplies. I made two lights that were roughly 8 feet long by taking a 1″x4″x10′ board and painting it white then attaching all of the gear to it. The result is one light for the bottom and one for the top that are 8 feet wide. Each have three strips of the lights – one and a half spools. This solved my issue with getting even lighting. The dimmers, it turns out, weren’t even necessary but I’m sure that I’ll find a use for them for lighting effects later. The studio is a 15’x30′ space that has the editing bay at one end. It’s not tiny – but it’s not spacious either. One of the problems that I had was that the front-fill lights (Interfit Photographic Super Cool Lighting Kit) weren’t able to be placed exactly the way I wanted. The two lighting stands that the two lights per side stood on ended up interfering with one another. The result was the lights were difficult to maneuver and difficult to place. 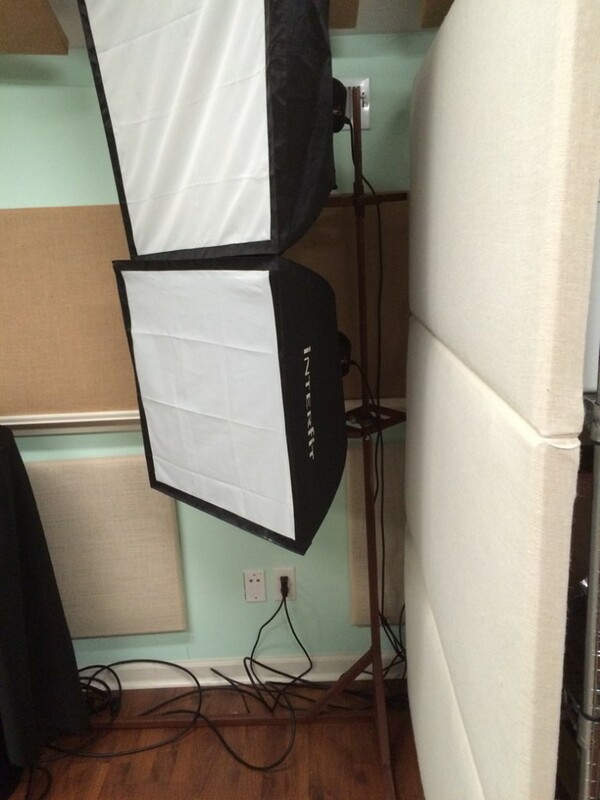 The solution was to have a friend of mine custom-create new lighting stands that are designed to mount multiple lights to and are designed so that the weight is all on one side – eliminating the need for tripod legs and making it easier to place. I really like the results even if I haven’t gotten around to painting them in chrome yet.